Red yeast rice is a colorful addition to various Asian dishes and beverages and is prized for its food-coloring abilities. These vibrant grains are also sold as health supplements, since researchers have discovered the potential cholesterol-lowering effects of the food. Despite this, the Food and Drug Administration pulled the supplements from American store shelves in 2007 due to concerns over their possible association with kidney and muscle problems. Produced by fermenting a type of red yeast known as Monascus purpreus over rice, this unique food is pleasing to both the eye and palate. 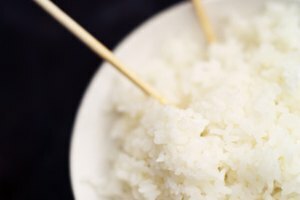 Soak the rice in a large bowl of cold water until each grain is fully saturated, for about 30 to 40 minutes. 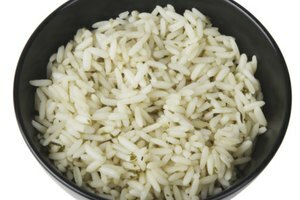 Drain the water from the bowl with the soaked rice and pour the rice into a cooking pan with a thickly lined bottom to prevent burning. 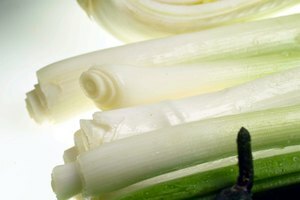 Add 1 ½ cups of water to the pan and cook on medium heat until the water begins boiling. Put a lid on the pot and turn down the heat to the lowest setting and let the rice simmer for 15 to 20 minutes. 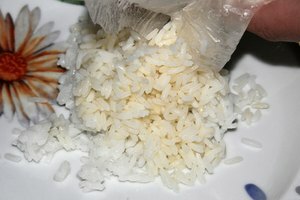 Turn off the stove and allow the rice to sit in the pot for about 10 minutes more, so the grains can settle. Remove the lid and check to see that all water has been absorbed. Then sprinkle 1 to 2 tablespoons of M. purpureus or powdered red yeast rice over the rice, and mix together. Put the lid back on the pan and allow the mixture to incubate at room temperature for three to six days. During this time the rice should become cultured by the M. purpureus and will turn a reddish purple color. Red yeast rice can also be prepared and eaten in the same way as regularly processed rice, and it is commonly used in Asian cuisines. Try adding red yeast rice to other foods such as meats and vegetables to add a colorful and healthy addition to your meal. Medicinenet.com profile of red yeast rice's potential health benefits and risks.